Harry the Cupid is gone for another year; did you collect your badge? Now, Dage the Evil is celebrating his birthday with a shop in HeroSmash. Few more items were added this week. But this the last week to get as Lucky Day is coming. We are hard at work getting the new, revised Smashdome ready. Along with the updated look to Smashdome, and we are adding the MegaDome to it. As a thank you to those that Beta tested monthly PvP and won (the PvP Champions), you are going to be NPCs (Dumoose's Team). PvP will remain, but the monthly poll and champion will be removed, as it has too many issues. PvP tokens will continue on for shop use and to claim a PvP Champion Badge. We are also currently working on updating game security to make it better and safer for all. We added a pacth recently and next planning another server move for game files to a new a faster one. Back to the... Drawing Board! As with Beta anything can and will happen, especially with bugs. To help get rid of some the bugs, we are planning on some changes to the Smashdome. For months now the team have been designing new arenas where players can face bosses at extreme difficulty for new type of rep points 'Honor'! Higher the honor you gain the better the prizes you can claim. Three new arenas have been designed and are ready to be turned into maps. Good and Evil arenas for normal players while the Mega Arena will be members only. Mega Arena where you face titan size monsters! The Mega Arena was built into an asteroid in space and entered via the teleport which will be going into the soon to be revised Smashdome. PvP will remain, but battle polls will be removed (but a shop with BP item will remain). The top 5 'all time' score holders will become Player NPC's in Smashdome. As testing has shown in Marketstreet, the Gremlins have a crazy bug where, at random, it makes them invincible for a random amount of time. We are doing our best to track down the bug so it does not happen again (especially to Mega Bosses!). 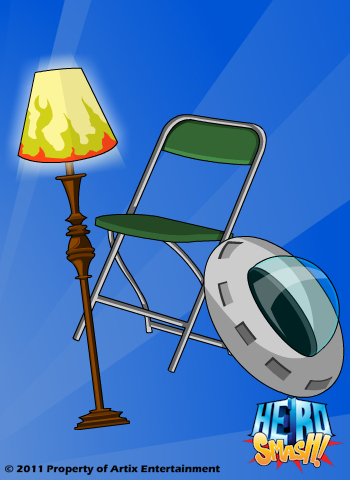 Popcorn drops will become a quest item, but for now, during the testin' phaze they can be traded in for rare movie plex gear (a few more will be added next week). Then the Blockbuster Event will be permanently replaced with Blockbuster 5D (You may already have seen the movie before buying the ticket and seen movie before it's made, while seeing a dozen movies multiple times! - 5D!). 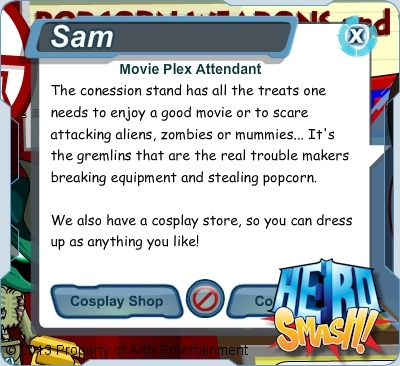 The Candy shop will remain and a new one to be added, the 'Cosplay Shop', where we will add winning movie items (based on the monthly forum poll) to it. As the art is coming together, I am now am extremely focused on picking the winner for the writing contest, so expect a winner very soon! One last thing we will have more HeroMart in-game items coming soon! Sorry for this weeks release being late folks, as many of you know, we are a smaller team in comparison to the other AE games. While we do try to release weekly, it is not always possible, especially when dealing with bugs. This time around there was a minor issue due to flash compatibility and I will not release buggy updates if there is a way to fix the bugs first. In this weeks release I will expand the possible PvP arenas in the Smashdome with the Smashmas arenas and the previously lost, but now found Aquatian arena. This is not a seasonal change, but a permanent change. I think of the Smashdome as a fight simulator where one can fight in any environment, at any time. On top of that, the changes I made to the menu will allow for a few more new zones to be added in the future! Smashmas war! I updated the old war to go along with the update changes to the game this past year. This caused an odd overlap issue. After reworking some of the code, things are looking good and if all goes well next release will be just what is wanted, war! The war will be different from before, but better late than never! We are also looking into the issue with the PvP leader-boards as some scores are not changing. Please report all bugs on the AE Forums! Greeting Heroes (and Villians)! 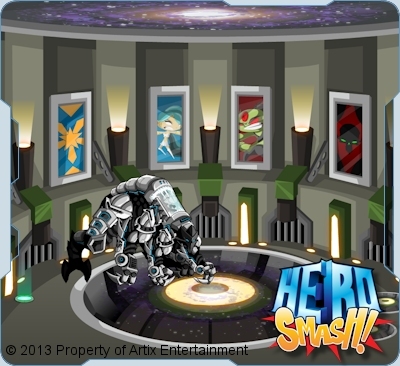 Randor the Red here with the latest news in the world of HeroSmash! First up is the Random Shop! This special shop contains many random and crazy things. Each day the contents will be randomly selected from our database, so be quick to get something you like because we don't even know when it will show up again. Next is the Battle Poll which already in progress but we will be lowering the total votes required, to speed things up this time around so do not be surprised when the total changes. New and previous Smashdome Champions will now have a badge in their HALdroid and character page to prove their hard work and prestige. When will you earn yours? Several new powers and balance changes have been made. Check out the full list here. PS Always click on your items to see if they have hidden actions to them, you never know until you try! HeroSmash PvP Member Testing Has Begun! 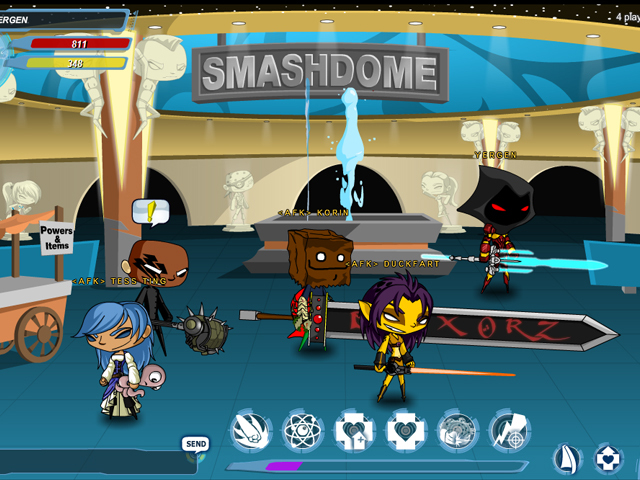 HeroSmash members (and those AQW VIP members) can now log in to HeroSmash, and have Dumoose take you to the Smashdome! There you can pick up your Ultra Rare PvP founder Armor and Sword, as well as some cool powers built with PVP in mind. Once you are itemed up – get in and start playing PvP!!! So the version members are going to be testing is most definitely a “work in progress”, but we are so excited that we had to let you check it out early. Remember that to make PvP we need YOUR input. Make sure you fill out all bug reports properly in the forums. Reporting to me or other team members via Twitter, will not make it get fixed any faster, Trust me, the forums is the most organized way to report PvP bugs. Here are a list of know Bugs – just to keep an eye out for them and confirm them. The Scores – Currently we are not tracking and saving your PvP score. The score system is working, and the score you are getting is correct, but we are just not tracking it… yet. Some Map Issues – Sometimes the maps tend to not load up. It’s all right though – simply /join smashdome again and re-queue. Of course report the bug and let us know. More Maps? – We will have more maps, but for the time being we just need to test the ones we have. Leaving a Queue – If you leave a queue and then try to get back in – well, that’s a bug, and you won’t be able to. To fix this you can do two different things. One, Simply leave the Smashdome, and come back, and everything will be back to normal. Two, Wait a good 10 seconds after you leave the queue before you re-queue. Always Say Yes - When you get asked to confirm loading into the match ALWAYS say YES. If you say no, then everyone gets lost in waiting limbo. If you really didn't want to play say yes, and then leave ove the match starts. Death Gate Re-Entry – When you die in PvP you get sent to the Death Gate (obviously). Super Death has arranged a portal to get you back into the game. Running over the portal will get you back fighting, but the portal can be a little buggy, and may need a couple of tries running over it to make it send you. What about the PvP founder Badge? That’s going to get awarded when the Member PvP testing is over (December 8th). What happens if your membership ends between now and then? No worries, as long as you were a member and tested PvP at some point before your membership ended, you will still get your badge. If you become a member at some point between now and the 8th and test PvP, then you will also get your badge. See? We think of everything (or at least try to). That’s all I can think of for now. So sit back, settle in, and time to get your Smash On!